We left the New Frontier RV Park in Winnemucca, NV early Friday morning, June 30, 2017. We had to drive to the pilot truck stop on the other end of town for diesel, then took US 95 north heading toward Burns, OR. The greenery on the side of the road was mostly shrubs and small grass and the terrain was rolling hills. US 95 is a two-lane road in excellent condition. There was minimal traffic and it made for pleasant driving. The land in this area is part of the Paiute-Shoshone Reservation of Ft. McDermitt, NV. 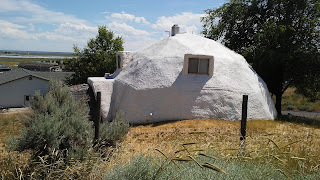 Although the fort is in Nevada the reservation continues into Oregon. 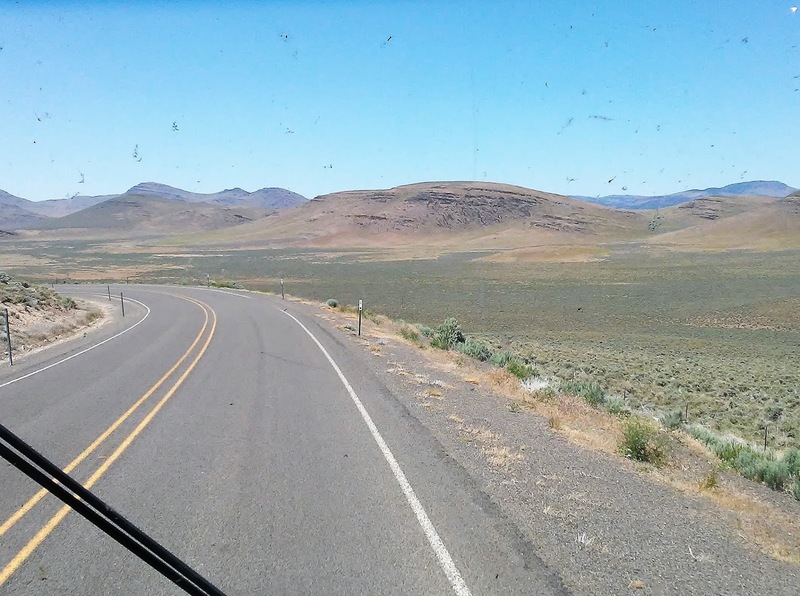 As we crossed into Oregon, the shrubbery went away and all the green we saw was just wild grasses, with no trees anywhere. After about 30 miles some scrub brush was added to the wild grass along the roadside. We saw several small herds of horses and a few cattle in the open range area. 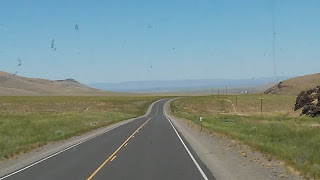 When we got to the intersection of US 95 and US 78, we took 78 northwest toward Burns, OR still moving toward the coast. Alongside US 78 we started adding trees to the mix of green growth. About 50 miles southeast of Burns, we started seeing irrigation and plush green grass, mostly for hay. I only remember one farm with crops, other than grass, but I could not identify the crop. We saw more and more farms that the hay was cut and ready for baling as we moved northeast. We got to the Burns RV Park in late afternoon and got a space under a tree that blocked our satellite reception for our TV. We also had a problem with our awning over our larger slideout. A gust of wind caught it when we were driving and did some damage to it, causing it not to extend or rewind properly when we moved the slideout out or in. I spent some time on a ladder and eventually resorted to a small hacksaw to cut away a rod attached to a gear on the roller that was causing us much trouble. The fabric is still torn, but I have it in workable condition, although it needs to be sewn before returning inland. 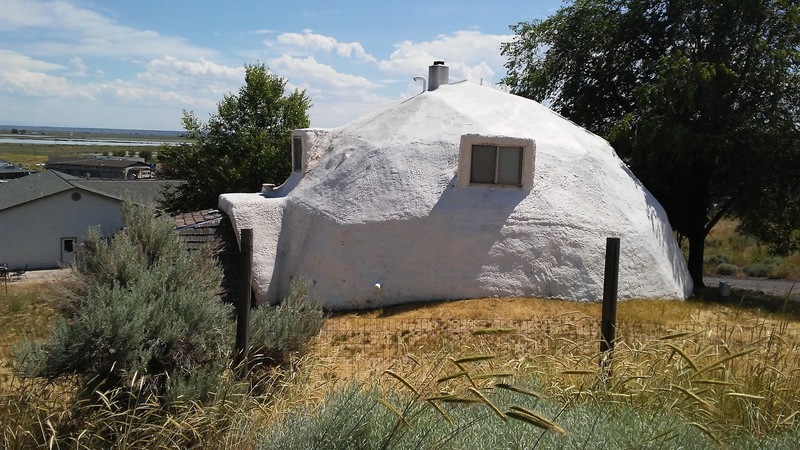 We did not want to travel on the Fourth of July weekend, so we ended up spending five nights in Burns. We ate one meal at the Apple Peddler restaurant and the rest of the time we ate at home. Burns is a tired old town and not much to see or do there. The biggest stores in town are farm and feed supply stores. Thursday, July 5th, we moved further west on US 20. We got lost for a little while in Bend, OR, as there is no US 20 bypass. You have to wander through town and I got lost. Making a U-turn is most difficult driving an RV and pulling a Jeep, so when we found US 97 we got on it and found where it crossed US 20 to put us back on track. We moved into the Life Northwest RV and Lodging in Harrisburg, OR. This is a nice RV park with paved spaces on the banks of the Willamette River. The property was purchased by the Life Bible Church a few years ago. We spent one night in Harrisburg and were ready to make it to the coast the next morning. Next post: The Deschutes National Forest and arrival at Lincoln City. I'm happy you and Mom made it to the coast this week. The temperature in the 60's midday sounds great to me. The Oregon coast is great in the summertime.